Physics in Nuclear Medicine - by Drs. 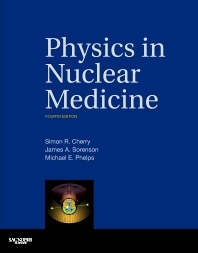 Simon R. Cherry, James A. Sorenson, and Michael E. Phelps - provides current, comprehensive guidance on the physics underlying modern nuclear medicine and imaging using radioactively labeled tracers. This revised and updated fourth edition features a new full-color layout, as well as the latest information on instrumentation and technology. Stay current on crucial developments in hybrid imaging (PET/CT and SPECT/CT), and small animal imaging, and benefit from the new section on tracer kinetic modeling in neuroreceptor imaging. What’s more, you can reinforce your understanding with graphical animations online at www.expertconsult.com, along with the fully searchable text and calculation tools. Master the physics of nuclear medicine with thorough explanations of analytic equations and illustrative graphs to make them accessible. Fully grasp the process of emission computed tomography with advanced mathematical concepts presented in the appendices. Utilize the extensive data in the day-to-day practice of nuclear medicine practice and research. Tap into the expertise of Dr. Simon Cherry, who contributes his cutting-edge knowledge in nuclear medicine instrumentation. 1. What is Nuclear Medicine?